Though branded as a smartphone, none of the built-in features and very few third-party applications actually make the Treo a specially better or smarter phone (as compared to a better PDA) than any other. One important exception to that is Suntzu Software's brilliant SMS Commander, which has been recently updated to version 1.08. The idea behind this very small (around 166 KB) yet feature-rich application is a simple one: use SMS messages to remotely initiate processes on your device while you are away from it. Those include the standard set of theft safeguards such as remote device lock, remote password-change and remote hard-reset partially offered by some other applications available on the market, but also a robust set of unique features which gives you almost total remote control of your device. Let's say you have forgotten your phone at home (or left it there on purpose while on a trip or for any other similar reason). 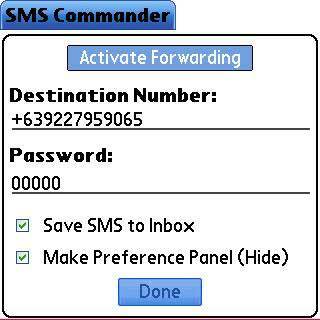 SMS commander lets you, via a simple remote SMS (which you can send from any other phone or even from the web if your service provider allows it), search your address book for contact details, view all missed, incoming and outgoing calls, enable call and SMS forwarding, and even initiate a phone call or send an SMS from your Treo though you might be hundred of miles away from it. This (subject, of course, to legal restrictions which might be applicable in your jurisdiction) can prove to be quite handy not only to keep all relevant data at the same place for future use, but also to avoid the ever increasing threats on ones privacy (such as some third-party's use of your phone's location to track you down or follow your activities). And if that is not enough you can also do quite a lot of remote maintenance to your Treo through features such as remote check of your battery level and signal strength and remote battery off, and even initiate any other Treo application remotely which you can use for example to record or filter incoming calls using the appropriate third party applications. All in all – SMS commander a brilliant set of handy tools which I think every sophisticated Treo owner should have with her at all times. Throughout my Palm days, and various palm devices, one of the applications I have most used and enjoyed is undoubtedly Card Export by Softick. This small (less than 100kb all in all) and stable application bundled with some USB cable, not only turns my Palm(s) to a handy always-on-me portable mass storage device but also offers a great alternative to HotSync for quick installation of software and transfer of data files from the PC to the Palm. And it could not have been simpler to use, either. Just connect the cable (you do not need a special one – the sync cable bundled with your Palm device would do nicely, but if you do need to buy one you can always check the excellent Brando offerings), press the button, and you have your external card added to the drive list in your windows explorer for your drag&drop pleasure. Legacy – by Redshift. An amazing, complicated and intriguing party-based Role-playing game. Together with its many expansions, this should provide you with dozens and dozens of adventure-filled hours. The Quest – Redshift's next generation game which offers some of the best story and gameplay around. A real must if you somehow missed on this one. EDGE – a monumental design and programming feat which, unfortunately is not stable or fast enough on my assortment of devices, but should nevertheless be tried out by every role playing game (or, for that matter any palm-gaming) fan. The good news are that though all the above titles seem to have been deep-freezed by their respective developers, the palm RPG community is thriving with new expansions, freeware and shareware, being offered continuously and some new games promised to be under construction. For the latest news from the scene I recommend checking out the fan boards. Ever since I have bought my first Treo device a few years ago, I have been thinking about convergence, and about giving up the most uncomfortable habit of carrying around the combo phone + PDA. Still, I could never quite find the right configuration which would satisfy all my needs in a single device. True, the Treo is a most capable device, but I am not sure it has ever been, or for that matter, could e the solution to my versatile desires. * Larger screen – though larger is not necessarily better (as a pocket device should be something we can carry around in our pockets or purses) I think the Tungsten size (480*320) is a minimum requirement. * Stronger CPU – quire a lot of horsepower is needed for both games and multimedia. Once again – my TX delivers, but the Treo much less so. * Larger RAM – some of today's top games already require more than 10MB to execute. Thus I believe 256MB should be the minimum for any next generation converged device machine (though, of course, a 8GB iphone-like configuration would be much welcomed). And at the same time – stability and cache sizes should be addressed too – we cannot rely forever on strange workarounds and hacks of the kind of UDMH and CleanStart. * Larger external storage – with the SDHC (SD high capacity) format becoming wider-spread by the day, Palm should not be left behind. * Regular stereo head-phones compatibility. Though Palm has undoubtedly originated as an electronic organizer, one of the main lures today of any portable device seems to be its recreational aspects such as e-book reading, web-browsing, multimedia capabilities, and, of course, my own favorite category – gaming. Mazera – a brilliant 2D adventure/puzzle game which shines on even the older lo-res devices. An absolute must in my opinion. 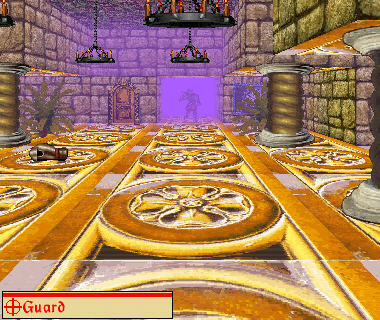 The Quest – a robust, magnificent 3D role playing game which would keep you entertained for dozens of hours (and much more if you go for any of the numerous expansions available through the net). ZdoomZ – the grand-daddy of all FPS (first person shooter) games is available for your Palm, and is still without competition in this genre. If long happy hours of thrilling monster-shooting is your cup of tea (or coffee) – grab it quick. LJP – not really a game per se, but more of a gaming platform this multi-platform emulator, can bring to the screen of your beloved Palm many titles written for devices such as the GameBoy color, NES, SNES and others. Thus, your Palm gaming experience can include such great titles as Pokemon, Zelda, Chrono and Final Fantasy III. WarFare Inc. – If you have not tried out this amazing RTS (real time strategy) game then you have not explored the full potential of Palm gaming. Highly recommended. Fish Tycoon – virtual life simulation and a real life addiction. A real must have. Upgrade at last. More than two and a half years after I have purchased my Treo 600, I have finally made the move to the newer Treo 650 model. My original reasons for preferring the Treo 600 over its younger brother which was already available at stores at that time were mostly financial ones, and so, when a great opportunity presented itself few days ago to buy the 650 second-handed from a friend, I finally did the step. And now I have a new (well, as new, at least…) shining device on which I can finally install and run all those applications which the lo-res Treo 600 could not manage. Namely these are the excellent RPG Legacy from Redshift (their newer amazing The Quest is too demanding in terms of memory to fit in with my other applications), the z-machine (i.e. interactive fiction) interpreter CellarDoor, and the document reading applications PalmPDF and Repligo (which both do work on the Treo 600 but the result is too poor due to the lack of hi-res screen). And of course, the use of DateBK and camera picture viewing, as well as general palming, are well enhanced by the excellent bright, sharp and vivid screen of the Treo 650. The only other features which differs my previous and current Treo models are NVFS (which I hate, yearning for the Treo 600's rock-solid stability) and Bluetooth (which I never had much use for). There also seems to be some problem with the IR port (I could not make my wireless keyboard work after trying anything and everything available on the net…) but it is currently less of a hurdle to me as I use my TX for such things (and other heavy duty staff such as huge games (The Quest mentioned earlier) or movie-watching (size does matter when we are talking about watching video…)). All in all I am VERY happy about my newest upgrade. Though I really like playing games on my Palm (and even more so – collecting them for a rainy day…) few games really grip me in the first minutes I try them out. One of them has been Astraware's newest game, Platypus, which I thought I just peek at for a moment to get the basic idea, and found myself playing continuously for the better part of an hour. Platypus, expected to be released later this week, is an import of the fantastic PC game by the same name developed by Squashy Software (that is, by Anthony Flack). 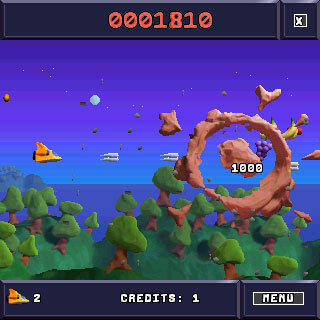 This fast paced side scrolling shooter, is noteworthy especially for the technique used for its creation – stop motion animation with plasticine (i.e. clay) models. This gives the game a very unique look and feel which contributes to the great gameplay. True to the side-scrolling genre the game is very simple to grasp – you shoot everything coming at you, while trying to avoid collision with enemy bombs, space-ships and other machinery and structure, and attempting to catch as many power-ups and bonus items as possible. The pure fun of the game comes from the brilliant clay graphics, great visual and sound effect, and diversity of landscapes, objects and obstacles you'll encounter in your effort to travel unharmed throughout the 4 elaborate worlds, each with its five mini-levels. And if you are anything like me (i.e. not really great at arcade games) then you will appreciate the option to choose the level of difficulty of the game. Pure, solid (well, as solid as clay can be…) fun. Highly recommended. One of the true must-have applications for any Treo owner is Hobbyist' Butler. This suite of handy software utilities, packaged in a small footprint (totaling about 200 KB) single application, offers a real "Swiss army knife" of all things Palm should have, but unfortunately did not, bundle with its smartphone devices. Among the rich features offered by Butler: sophisticated alarm setting and handling, management of system notifications (such as missed incoming calls, SMS and voicemail), better use and control of the phone led (e.g. turning it completely off at night, and using it to indicate missed system notifications), nifty additions to built-in button features (such as extending the one-key-press application launch feature to work outside the phone application or the ability to use the side volume keys to quickly switch to a previous application or scroll up and down inside a document) and advanced security features (including the ability to remotely lock or wipe the memory of your phone by sending a password identified special SMS). The variety of features can totally change your user experience, leaving you wondering how could you have managed your daily life without it. Though a thorough discussion of the various features is beyond the scope of this short post, I would like to elaborate a bit about two of the features, which make Butler for me a real "killing application": the handling of alarms and that of system notifications. Butler' alarms is a sophisticated feature, in par with dedicated alarm applications. 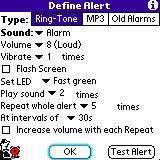 Not only does it offer the setting of multiple daily alarms, each of which with its own setting of volume, repetition frequency and interval, and such additional attention-grabbers as flashing screen, graduate volume increase, led blinking and vibration, but you can also choose from the built-in midi ringtones or the a use an external MP3 player to play your favorite tune. In addition, you can customize the alarm message and event have your choice of application launched as soon as the alarm is clear (which might be great for, example, to easily view today's schedule, or the expected weather…). Notification handling or the "attention grabber" as it is called in Butler, is really something I cannot understand how Palm has failed to bundle with the Treo. The idea is simple – whenever you miss some system notification, such as a phone call missed while you where out of the room, Butler is there to ensure you would not fail to notice it. Thus, for example, you can make butler set the led to orange color in such cases (which is super handy in noisy environment as a simple peek at the phone, without turning the screen on, would reveal that you have missed a call/alarm/etc. ), or ask that a short beep alarm would sound every five minutes to remind you of the need to attend the notification. In addition, and to avoid waking out at night due to some stupid missed SMS, you can also tell Butler not to nag you during such and such hours. More than its diverse collection of great tools, Butler is worthy of high commendation for its attention to the smallest details. Thus, for example, if you set an alarm while your ringer is switched to silence, you would get a warning message (which has saved me time and again from missing my alarms). Similarly, great attention and effort has been put into squeezing out the most of each of the various Treo models. Thus, for example, Treo 600 owners are offered a way to compensate for the lack of a built-in message privacy feature which prevents SMS messages from being immediately displayed, while owners of newer Treo models have some additional features available for manipulating the red and green phone hard buttons. 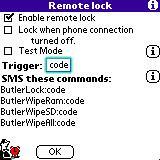 All in all Butler is a very professional, highly polished application, which I would personally recommend as a first choice for any Treo owner. Side by side with great sophisticated (and sometimes quite heavy in terms of memory and CPU requirements) applications, I have on my Palms several small utilities, mostly freeware, which are there simply to make my daily life a bit simpler and more organized (which is admittedly the core idea behind owning a Palm in the first place). One of the ones I would like to heartily recommend is: TeaPot. TeaPot is a simple freeware timer which can be easily set to sound an alarm within a specified time period ranging from one minute to 99 minutes. My uses for such a timer are plenty – from timing cooking steps such as my pasta or hard boiled eggs, to carefully following the package directions of drain openers chemicals. Though very small (only 76 KB sized) TeaPot is quite a rich utility offering up to four concurrent timers, the ability to choose the alarm sound, type and volume and even a choice of some quite animations for the display. Though there is quite a lot to be said in favor of Palm's build in PIM applications, including their ease of use, efficiency and good coverage of commonly needed features, I am quite sure any real Palm addict would quickly find herself searching for some 3rd party software to extend and augment that total PIM experience. Calendar and Tasks – I use DateBK5 which, in my opinion delivers the best deal in terms of richness of features, rock-solid stability, ease of use and price. I have licensed the newer DateBK6 some months ago but as I use my Treo600 as my main device I prefer to stick with the excellent DateBK5. The main advantages over using the built in Calendar and Tasks: an integrated display of tasks and meetings just like in a paper calendar, extended features for tasks and events (such as icons, advance notice, floating events and feature-rich alarms), use of templates, monthly graphical display and many more. I also use 2day which is a superb status screen to see in a glance all current information of importance to me about meetings (including a nifty "free time bar" which shows me the time I have today between meetings and other obligations), tasks, the weather (using the 4cast plugin) new mail sms and phone messages and various information about device status. Contacts - on my Treo 600 I use the brilliant TAKEphONE which besides being a great dialer offers very strong and intelligent progressive search logic which can usually trace your desired contact as soon as you type in the first letters of any of search fields. This means that not only can you find a contact by either its first name, surname, company name or various other fields (including custom and note), but it is also turbo-fast usually requiring but a few key strokes. TAKEphONE is of course much more than a contacts application – you can use it to quickly send SMS or initiate a new mail to any of your contacts, easily dial numbers from any other applications etc. On my TX (which lacks any independent phone-like features), I prefer the simpler PhoneMagic application, the main advantage of it over the built-in Contacts is its quick search algorithm (similar to that of TAKEphONE). Memos - the hand-down champion in this category is undoubtedly the brilliant pEditPro, which is too robust to describe in this short post. Suffice to say that more than a feature-rich sophisticated memo application this is actually a whole set of editing tools, especially suitable for heavy tasks such as taking lecture notes and editing long texts with its superb support of external keyboard and very rich built-in scripting language. Highly recommended. Notes - I do not really use notes as I find my Palm handwriting too difficult to read (even for me) and my typing speed to be good enough to make this application of little use to me. Thus I stick with the built-in notepad though there is certainly a lot of place for improvement if you do use your palm to scribble notes. One recommendation that comes into mind is BugMe which offers the much needed ability to add an alarm to your note. Calc - though not a PIM application per se, a good calculator is something I sure need on me occasionally, and Palm is somewhat lacking in this regard on each and everyone of their devices. After going through dozens of alternative I have finally settled on EasyCalc as my calculator of choice, not only as it is free, but mainly due to its sophistication, ease of use and ability to retrieve past calculations (not only the result but the whole line of the original calculation).